SANTA FE, Texas -- New details have emerged about the heroic effort to confront a young man who opened fire at a school Friday, which prevented a larger tragedy. Ten people were killed and at least 13 others were hurt, including a school resource officer. Authorities say they don't have a motive, though the suspect's father gave his own explanation. Suspect Dimitrios Pagourtzis, 17, sits in a county jail under suicide watch. On Friday, as terrified students ran away from the school, police and SWAT teams arrived four minutes after being alerted. Police took cover in a hallway, even as the shooter continued shooting at them from inside a classroom. The gunman finally surrendered unharmed. Galveston County Sheriff Henry Trochesset told CBS News that students were not hit by friendly fire. "I saw videos. I saw what occurred, from the viewpoint of the cameras, I don't believe so," Trochesset said. The tight-knit community of Santa Fe is still reeling from a tragedy that many thought would never happen in their small town. Ten white crosses were placed at a memorial outside Santa Fe High School while a 10-second moment of silence was observed across the state Monday morning to remember the victims. Crosses line the lawn in front of Santa Fe High School on Mon., May 21, 2018, in Santa Fe, Texas. 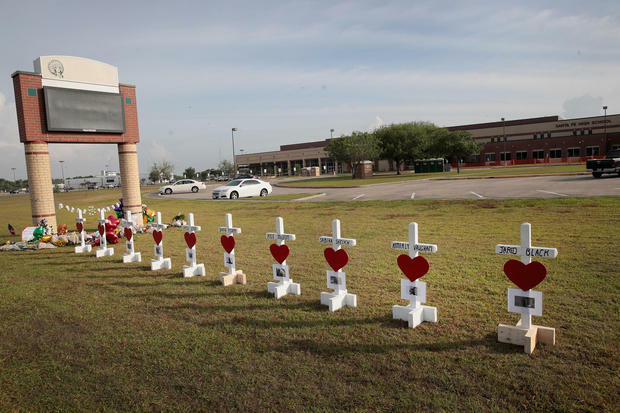 The crosses are a memorial to the victims of last Friday's shooting when 17-year-old student Dimitrios Pagourtzis entered the school with a shotgun and a pistol and opened fire, killing 10 people. Antonios Pagourtzis, the father of the shooter, told the Wall Street Journal his son was "a good boy" and had been "mistreated at school." He said his son was bullied and said, "I believe that's what was behind the shooting." "It's hard to answer what he realizes at this point. Our conversations have been very stuck in the immediacy of the moment," Nicholas Poehly, one of Pagourtzis' attorneys, said. "We're not able to say right now what he comprehends." Sonia Salazar came to the school to pay tribute. Her daughter, Sarah, is recovering from gunshot wounds in the neck and shoulder. "I know. I can feel their pain. I can feel the parents' pain ... because I went through it," Salazar said. "So I know how it is. That's why I wanted to come and see if anybody was here if I could talk to anybody. But I feel for them. And the whole city. The whole city is sad." 0 Response to "Santa Fe High School shooting suspect's father says son was bullied"